Articles like “As PCs Wane, Companies Look to Tablets” are both true and bogus. PCs aren’t going anywhere because they’re cheap. You can buy them reasonably close to cost. If you want the least expensive means of computing possible, you can’t beat PCs now and won’t be able to for years, at the very earliest. Sure, “making them has not been a great business for most American companies for almost a decade,” but that’s because consumers are deriving so much surplus from PCs. PCs are close to commodities, which is great for buyers, if not sellers. The industry, the reporters who cover the industry, bloggers, and other people with a stake in the action want you to believe “TABLETS TABLETS TABLETS ARE COOL!!! !” because they want you to buy relatively high-margin tablets (and they need something write about). Current tablets are high-margin because they combine commodity hardware with OS lock-in. The industry wants to move closer to Apple’s model, since Apple gets away with what it does because a) it has great design and b) for a long time, and maybe up to the present, OS X was more fun and in some respects better designed than Windows. Lock-in and high margins? What’s not to love from a business perspective? It’s not very much fun for journalists and bloggers who drive these stories about PCs to write, “Area man continues to derive immense intellectual, social, and efficiency value from the PC he bought five years ago and which continues to meet his needs adequately.” I wouldn’t read that story or post either. The tech press needs to find hype and trends. Tablets and cell phones are of course genuinely big deals and their impact will continue to reverberate—but just because one sector is waxing doesn’t mean another is automatically waning. Especially when that sector offers a lot of value for the money. So: every time you see a call for tablet computing, regardless of its source, you should remember that somewhere behind it, there’s a manufacturer who wants to sell you more stuff at higher prices. Paul Graham calls such beasts “the Submarine,” and if you want to understand how you’re being marketed to, you should read that essay. The PC manufacturer can’t really sell you more stuff in PC laptops and desktops these days because they’re too inexpensive and interchangeable. Apple can sell you design and an unusual operating system. Maybe Lenovo can charge above-average prices because of the Thninkpad’s reputation for durability, but that’s it. Everyone else is scrambling because consumers dominate producers when it comes to PCs. So we get stories like the one above; and, if, as Tyler Cowen speculates in this example, the U.S. economic model moves closer to Japan and capital depreciates, expect to see even more calls for tablets and so forth. Anything to avoid acknowledging that an existing stock of capital is Good Enough. Computer makers are expected to ship only about 4 percent more PCs this year than last year, according to IDC, a research firm. Tablets, in contrast, are flying off store shelves. Global sales are expected to more than double this year to 24.1 million, according to Forrester Research. How does an increase in the absolute number and the percentage of PCs sold an indicating of waning? I think that means computer makers will ship over a hundred million units, compared to a quarter as many tablets. I checked out Dell’s website, and one can buy a very nice Inspiron desktop with a dual-core AMD processor, 3 GB of RAM, and a 1 TB hard drive for about $400. Get a cheapie 20″ monitor, and you’ve got a very competent machine that’ll run Windows passable well for under $600. Get a sweet 24″ IPS monitor as good or better than the one in my 2007 24″ iMac for another $500, and you’re still under $1,000. That’s why desktops aren’t going anywhere and all this blah blah blah about tablets is important but also overrated by tech sites chasing the new shiny but who also think that everyone has, if not an unlimited budget, then at least a very substantial one for technical toys. Given my work, it’s probably not surprising that I have a higher-than-average budget for technical toys and tools, since I use my computer every day and often for very long stretches, but for people who aren’t writers, hackers, day traders, pornographers, and the like, having an expensive computer and a tablet and a phone is, if not overkill, then at least overpriced. Some people get this—here’s a Time story that’s as an example—but too many don’t, especially in the press, which follows the tech industry like a marketing arm instead of an independent evaluator. One more point: PCs are still better for some tasks. Maybe not for browsing Facebook and YouTube, but anything that requires a keyboard isn’t just better on a computer—it’s way better. Maybe students are going to write papers on iPads or iPad-like devices, but I’m skeptical, and even if one has a couple of substantial text-writing efforts a year, it’s going to be tempting to keep a keyboard around. I could be crazy; people are apparently writing novels on cell phones in Japan and now other countries, but producing a novel on a phone doesn’t sound appetizing from the perspective of either the writer, who can’t really get in the zone over the course of a hundred words, or the reader, who has to endure writing from someone who doesn’t appear to, say, go back and edit their novel as a coherent whole. Most people don’t seem to much like 19th Century novels that were published serially, and “lack of editing” and “lack of brevity” might be two reasons. The first will probably haunt cell phone novelists. Then again, looking at the bestseller lists, maybe there isn’t much to go but down. Yeah, which is why the “post-PC” terminology has a propaganda tone. It’s not going to be “post-PC”: more like “pop computing” or “computing lite”. He’s right. Which is okay: I have nothing against tablets or cell phones. Use whatever works. Just don’t pretend PCs are going away or automatically declining. 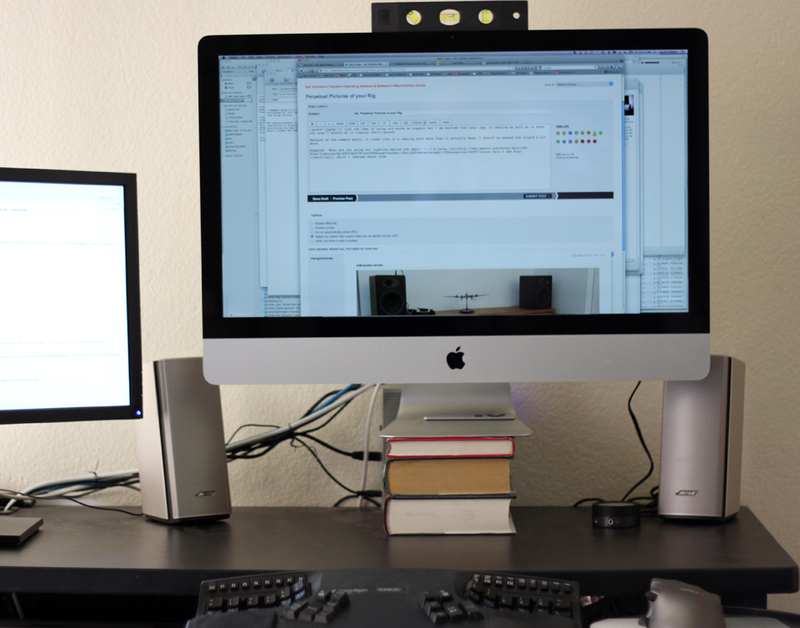 EDIT 2015: As of this edit I’m using a 27″ Retina iMac. The hardware is incredible. The best is still yet to come. See also this post on whether you should buy a laptop or desktop and this related post on the reliability of each form factor. 1)laptops use a lot less energy than desktops, and tablets use a lot less than laptops. I suspect that the energy efficiency won’t totally pay for itself, but it probably is a factor. 2)slow boot/shutdown times bug the heck out of me, and a newer operating system or newer machinery would significantly improve that. Also, the time to build a new OS on the old machine is nontrivial. 60-90 minutes– but a new computer already has a configured OS for you. 4)A tablet when paired with a bluetooth keyboard can be extremely useful and more portable than a laptop or desktop. I have a laptop, desktop and tablet and feel that this is not really overkill. I’ve gotten tremendous use out of the ipad, and it’s taken a lot of time from time normally spent with a laptop. On the other hand, I find laptops offer more robust applications and let you switch more easily. 5)I’m sorta in the market for a replacement for a PC (which is 5-6 years old). I got lots of good use out of the desktop, paid for several upgrades, lived through certain disasters and generally feel I got my money’s worth. Laptops these days have the performance of this desktop, but not the storage space.My old PC was a power hog, and frankly the tower was ugly and a gigantic heat monster (I suspect desktops today are a little more compact and cooler). 6)In hardware, if a device when sold doesn’t make a lot of money, there are a lot of quality compromises, Technical support, hardware reliability, etc. I don’t think we’re there yet, but we will soon come to a day where PCs are just inferior in every possible way. The good news is that there are more commmodity replacement parts for laptops, so it is not as hard to get them serviced locally as before..
Good analysis. As you know, I entered the computer world about 20 years ago and still think a desktop or a laptop with extra monitor, keyboard, etc., remain the best and least expensive computing solutions. This is particularly true, if one produces content in addition to consuming content. For those who are mostly watching videos, texting, Facebooking, etc., the combo of a tablet and smart phone is probably sufficient, as long as the person has enough money to buy the hardware and support the monthly cellco costs. Of course, if there’s free and handy wi-fi, then it is just a matter of the hardware and not misplacing or breaking the stuff.